Waste plastic granulation extruder (plastic extruder) is a device for extruding, cooling and dicing polyethylene (green film, lining bag, etc.) or polypropylene (old woven bag, packing bag, tying rope, etc.) to produce plastic granules. The granules produced are widely used and are ideal investment projects. This equipment is matched with the crushing and cleaning machine and the pelletizer. Broken and cleaned plastic can be directly put into extrusion granulation. Simple process, advanced technology, and suitable for different waste plastics. Waste Plastic granulation extruder adopts automatic temperature control and electromagnetic heating, with less electricity, no pollution and high automation. It adopts special screw design and different configuration and is suitable for the production of PP, PE, PS, ABS, PA, PVC, PC, POM, EVA, LCP, PET, PMMA and other plastics for regeneration and color mixing granulation. The high-torque design of the gearbox achieves smooth performance without noise. The screw and barrel are specially hardened, with wear resistance, good mixing performance, high output characteristics, vacuum exhaust or ordinary exhaust port design, which can remove moisture and exhaust gas during production. More stable, the particles are stronger, ensuring good quality. 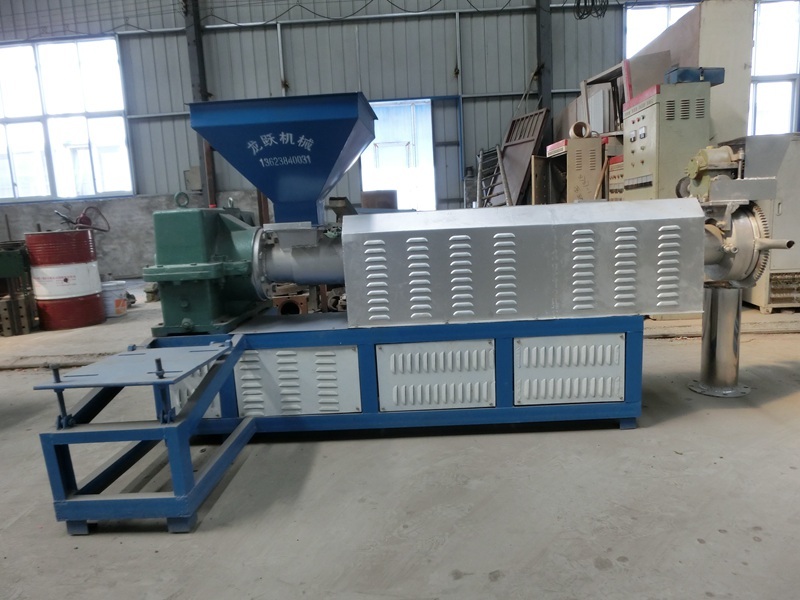 Waste Plastic granulation extruder According to the angle between the flow direction of the head and the center line of the screw, the machine head is divided into a bevel head (120o angle) and a right angle head. The outer casing of the machine head is fixed on the fuselage by bolts. The mold in the machine head has a core sitting and is fixed to the inlet port of the machine head with a nut. The front of the core seat is equipped with a core, a core and a core holder. The center has a hole for passing the core wire; a pressure equalizing ring is arranged at the front of the machine head for equalizing the pressure; the extrusion molding part is composed of a die sleeve seat and a mold sleeve, and the position of the mold sleeve can be adjusted by the bolt through the support In order to adjust the relative position of the die sleeve to the core, it is convenient to adjust the uniformity of the thickness of the extrusion layer. The outside of the machine head is equipped with a heating device and a temperature measuring device. The screw is the main part of the plastic extruder. The quality of the screw is directly related to the application range and efficiency of the plastic extruder. The screw is made of high strength corrosion resistant alloy steel. Barrel of a plastic extruder refers to a metal cylinder which is made of alloy steel or composite steel pipe lined with alloy steel. This steel has the characteristics of high heat resistance, high compressive strength, Strong wear-resisting, and corrosion resistance. The barrel is used in conjunction with the screw to achieve pulverization, softening, melting, plasticizing, venting and compacting of the plastic. It also conveys the rubber to the molding system continuously and uniformly. Generally, the length of the barrel is more than 15 times its diameter. The main function of it is to make the plastic fully heated and fully plasticized. A cutting device is installed at the bottom of the hopper to adjust and cut the material. The side of the hopper is equipped with a sight hole and a calibration metering device. The machine head consists of an alloy steel inner sleeve and a carbon steel jacket. Molding mold is installed in the machine head. The function of the machine head is to transform the rotating plastic melt into a parallel linear motion so that the plastic melt is introduced into the mold sleeve evenly and smoothly, and the plastic is given the necessary pressure for molding. A split sleeve is usually placed to ensure that the plastic flow path in the machine head is reasonable and eliminate the dead angle where the plastic accumulates. Besides, a grading ring is usually also provided to eliminate pressure fluctuations during plastic extrusion. Mold calibration and adjustment device are also installed on the machine head to adjust and correct the concentricity of the core and the mold sleeve. The function of the transmission system of the plastic extruder is to drive the screw. It also can provide the torque and speed required for the screw during the extrusion process. In general, the drive system consists of a motor, a reducer, and bearings. Heating and cooling are important conditions for plastic extrusion processes. (1)Plastic extruders are generally heated by electricity which is divided into resistance heating and induction heating. The heating piece is distributed in the machine body and the parts of the machine head. The heating device heats the plastic in the cylinder from the outside, and the heated plastic is in a liquid state, which is convenient for processing. (2)The cooling device is set to ensure that the plastic is in the temperature range required by the process. Specifically, it is to eliminate the excess heat generated by friction when the screw rotates. It can avoid too high temperature produces some problems, such as plastic decomposition, plastic burning or plastic molding difficulties.